HAVE YOU SEEN THIS MAN? 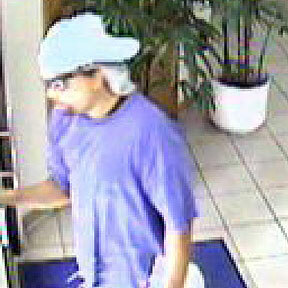 This is how the suspect looked Friday at the Kaneohe Central Pacific Bank robbery. Officials suspect the same man was involved in six other bank robberies dating back to October. 2000 world champ and Hawaii native Sunny Garcia pleads guilty in federal court. The Hawaii teen fails in her qualifying try for the U.S. Open men's tournament. Teen Acting Company builds confidence and a sense of teamwork. Yes, a teenager from Hawaii will play in the U.S. Open next week. Oahu home prices and the number of homes sold rose in May, surprising Honolulu real estate agents. Michelle Wie was in contention for qualifying for the U.S. Open before making miscues near the end of her rounds.